Today isn't just Groundhog's Day, it's "Lung Leavin' Day" - a commemorative day sparked by Heather Von St. James who had her lung removed eight years ago today due to mesothelioma. Check out the ritual she cultivated on her website and an interview with her here. This is a very specific cancer caused by asbestos exposure. Most people diagnosed don't last a year, but she was lucky to find a specialist who was willing to remove a lung to save her life. How to tell if your tiles are asbestos. She wore her dad's work coat as a kid. That's all it takes. 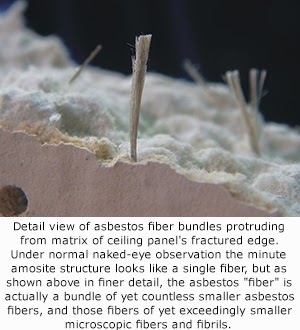 Asbestos is in many older building - any construction done in your home or workplace pre-1980s might mean you have asbestos lurking somewhere: insulation in your attic or ceiling tiles above your head as you work. It's one of those things I try not to think about too much as I go about my day in my 87-year-old house, and 159-year-old school. And let's not talk about the number of old houses I've gutted over the years when I stupidly took no precautions, as I'm sure many don't. Somehow I'm wary of lead paint, wearing full body-armour and a ventilator to strip wood, but oblivious to asbestos wearing only a t-shirt and shorts to put in a floor on top of the attic insulation. Attention must be paid. And some still want to export it. "As recently as 2010, Canada was producing 150,000 tonnes of asbestos annually, all of it in Quebec, and exporting 90 per cent — worth about $90 million — to developing countries. More than 50 countries ban the mining and use of asbestos because it causes cancer, but Canada, traditionally a major exporter, has successfully lobbied in the past to keep it off a UN list of hazardous substances." A park in Sarnia - a former asbestos producer - was recently closed last spring because they found asbestos in the soil. 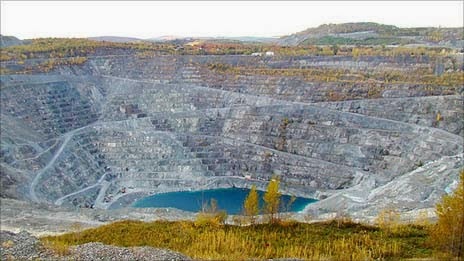 The Jeffrey Mine in Asbestos, Quebec. 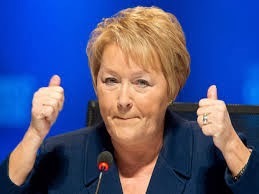 The Jeffrey Mine in Quebec is the last of them, and the province, under Marois, refused to financially help them restart production. Ottawa offered $50 million to keep the plant open, but Quebec refused it. And a lot of people lost their jobs. It's been "temporarily closed" since October 2011. It's a hopeful sign, at the very least, that some politicians can sometimes see the forest for the trees. It's always horrible to take away jobs from people in need, but those jobs are deadly - for the employees, their families, and anyone working with the product down the line. We have to focus on the bigger picture in everything we do from here on in. Of course we need sufficient help for those affected by the immediate changes to our economy, but change it must.